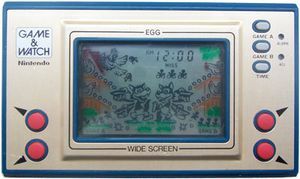 Egg is a Game & Watch game that was released as a part of the Wide Screen series on October 9, 1981. Nintendo acquired a Disney license and simultaneously released a version of this game as the first Mickey Mouse Game & Watch game. The Egg variation was not released in Japan until Game & Watch Gallery 3, which includes Classic and Modern gameplay. In the original version, Zeke Wolf (or Mickey Mouse) must catch chicken eggs sliding down a conveyor belt. Each egg gives the player one point, and if the player can get 200 and 500 points, all misses are erased. As the game progresses, the eggs will slide down faster. If an egg breaks while a chicken (or Minnie Mouse) is out the window, a baby chicken will pop out of the broken egg, and the player will get half a miss. It is only Game Over if the player gets three misses, though, so the player will still be playing if they have 2.5 misses. In the Modern version, a Light Blue Yoshi needs to catch Yoshi Cookies that have just come out of the oven in its tongue. The Yoshi earns two points each time it eats a cooked cookie. Sometimes, a Bob-omb slides down a conveyor belt. The Yoshi must avoid eating this foe, or it faces getting a miss. If Mario pops out of any of the doors, the Yoshi will get half a miss if it misses a cookie. However, eating a Bob-omb while Mario is present would still count as a whole miss. If the Yoshi eats enough perfectly cooked cookies of a particular type, a Yoshi-shaped cookie will appear. If the Yoshi eats that cookie at the right time, it will create a Yoshi Egg, earning 10 points. The Yoshi can make up to two Yoshi Eggs, and if it continues to catch cookies without missing, one egg will eventually release a Baby Yoshi, rewarding the Yoshi with 10 points. The Baby Yoshi will temporarily eat cookies at a certain angle, earning five points for each cookie it eats. Getting a miss while an egg is present will cause the egg to disappear. At 200, 500, and 700 points, a Heart will appear and slide down one of the conveyor belts, and if the Yoshi catches it, a miss will be removed. The Modern version also features music, with the tempo changing depending on the speed of the game. This page was last edited on April 8, 2019, at 01:43.